I'm in the midst of a stretch that I hope will make it until six months. There are two main reasons why this stretch may prove to be successful. First because my new growth seems to be the most tamed it's been in a long while. I've got to go back into the archives to see what I've been doing differently over the past 3-4 months. It's working whatever it is. Secondly, I think my winter growth cycle is yielding less new growth than the summertime. I read an article abstract where hair growth was measured in caucasian males. Researchers discovered that peak growth rates in the warmer months were up to 60% higher than at winter levels. I believe this has something to do with the decline of overall blood circulation that occurs in our bodies when the weather cools down. You see, as the temperature drops, our body's natural protective responses encourage increased circulation and blood flow to our internal organs. As a result, our extremities are left feeling a bit deprived. Notice how your fingers and toes are the first parts of your body to get really cold? That's partly 'cause the warming blood flow is not as prevalent in your fingertips as it is in other parts of your body. Remember that our scalp is also considered somewhat of an extremity. I suspect the amount of nutrient rich blood to the hair follicle is at below optimum levels in winter months. A picture speaks louder than words. 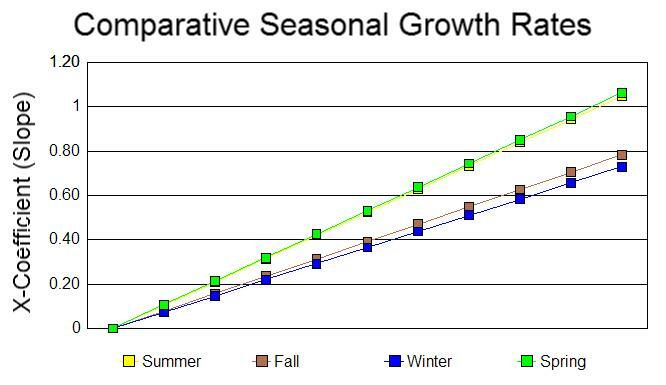 Check out this chart below taken from a study done on hair growth cycles throughout the year. Since we have a hair journey to attend to, we can't have something as simple as cold weather slow us down. We've got to keep moving! Oh, and by the way, you know that seasonal shedding we always seem to get? I have a hunch that poor circulation to the roots may have something to do with it also. So then let's discuss some methods of promoting much needed circulation even during the winter months. I did a video on this subject a while ago. It's a habit that I had almost forgotten about until recently. I watched the video again and was reminded of the feeling I would get when I finished a bottle of room temperature water early in the morning. It was as if I could feel the liquid traveling all throughout my body. I felt alive! Even now, whenever I feel sleepy during a mid-day meeting, I instantly swig some water and, moments later, I'm alert and my mood has changed. Water is one of the best methods of promoting internal circulation. Because our bodies are made of water, the liquid flows easily and instantly throughout our bodies. I put water first on this list simply because it's foundational to our health. You can be doing all the other stuff on the list below but if you aren't using water as your leverage, you may be fighting a loosing battle. Let's face it, as the temperature drops, drinking adequate water just isn't a priority for us. Let's get healthier by shifting our focus. So make sure you're drinking plenty of water this winter and start this habit first thing in the morning. Next on our list is heat. I'm not talking about flat iron/curling iron type of heat. I'm thinking more of the heat that comes from our environment. In the summer time, we have a heat source warming our skin for most of our waking day. I think when heat is exposed to a certain part of our body, it responds with increased blood flow to that area. I was watching a movie once, there was a scene where a little girl removed her cast she wore after breaking her arm. Under the cast she kept wanting to scratch with her pencil and, when the cast finally came off, her arm hair was long and thick like a primate. Long after the scene change I racked my brain about the cause of the wonderful and awkward hair growth. What was it about the cast that created this result? The only answer I could come up with was the heat (and humidity) generated by the cast. The best way I could think of to create heat-promoting circulation is to visit a steam room. In a steam room, you get both heat and humidity to your entire body. If you don't have access to a steam room at your local gym or spa, make sure you are using your steamer (or hooded dryer) while deep conditioning. Another way to help promote heat is through exercise. I know that most of us want to stay all bundled up in the fetal position when it's cold out, but doing that will only promote the results we don't want. Exercise gets the heart beating which guarantees blood flow and increased circulation all over. Physical activity usually requires us to breathe more deeply which fills our body with oxygen which helps feed the hair follicle. Plus if you start exercising now, you are avoiding the dreaded winter fat storage syndrome so you will be ready for shorts and dresses in spring. One of my circulation powerhouses is the use of cayenne pepper. I've used cayenne in my drink and I also sometimes take supplements orally. Years ago I tried using cayenne on my scalp but I accidentally got some in my eye and I decided that I would never do that again. Nothing like the feeling of getting maced your own shower. Cayenne is such a powerful circulation aid that it's said to have the ability to stop a heart attack in it's tracks. I read online that no other herb moves blood faster than cayenne. Using it can make your other supplements more effective as it helps other nutrients travel in the body faster. Cayenne is an acquired taste so you gotta work up your resistance to it a little slowly. Finally, the mother of all circulation boosters for healthier hair growth is scalp massage. I've written post, after post, after post on scalp massage so I don't think I need to ramble, but what scalp massage does more than the other circulation-boosters I listed above is have the ability to bring blood flow directly to the hair follicles. There's no guessing if your hair will benefit from scalp massage, you know that your efforts will directly bring extra attention to your roots. And nothing but good can come out of that. Scalp massage is one of those things, like everything else I mentioned above, that must be done consistently as a habit in order to produce desired results for you. So have fun and take control of your hair growth this winter! Be sure to stop by for my next post when I recap all the learning and focus of 2011.....see you soon! I really need to work on drinking water more often. I really don't like the lack of taste but I guess I can add a little crystal light. Great post. Thanks for sharing. Yes, I always notice increased growth when I am exercising regularly. Can't wait to see ur yearly recap post! Drinking enough water is my weakness too. I exercise about 4 to 5 times a week already. I live in the southeast. I also have a cayenne pepper bush in my backyard. I gave away a lot of peppers this past summer and my family and I ate a lot of peppers. I think I will start deep conditioning with heat again. Thanks for the post. Never thought of Cayenne pepper. I'm going to try that! & for Toy and others who do not like the lack of taste of water -- try training your mind to love the refreshing feeling of water. I cut soda and juices out of my diet and only drink water and tea and I have learned to love it. I agree with you that drinking a lot of water in winter season will help in increasing hair growth. But How can i increase the volume of my hair. Can you post some tips on it???? Thanks for the tips! I think another factor with the cast was the fact that the hair was left alone/not disturbed. Sort of like protective styling.